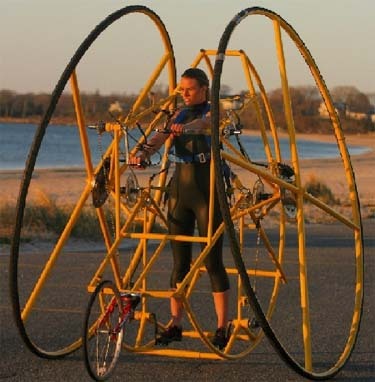 The Hyperbike is a working prototype created by inventor Curtis DeForest for a human-powered vehicle that will be faster than a traditional bicycle and much safer. In creating the HyperBike, DeForest tried to remedy the flaws of the standard bicycle. For one thing, it has no seat; the rider stands upright. Also, the arms are used for additional power. DeForest describes pedaling the HyperBike as "swimming on dry land." Motor vehicle speeds of at least fifty miles per hour are easily attained. The wheels are sixty-four inches apart at the road surface and only twenty-six inches apart at the top of their eight-foot diameter; racing wheelchairs also use heavily cambered wheels. One of the most interesting differences lies in the greater stability of the HyperBike. A conventional bicycle has the center of gravity higher than the spinning axis of the wheels. The HyperBike positions the rider in such a way as to put the center of gravity below the wheel axis. Apparently, it is the stability and balance of weight relative to spinning forces that has NASA interested. These factors would make the Hyperbike a good choice for low gravity environments. The NASA-funded Space Alliance Technology Outreach Program has invested some capital in the development of the next model. Bicycles in low gravity? I think I've heard that one before - don't all the lunar prospectors have one? Lunocycles figure in Robert Heinlein's 1952 novel The Rolling Stones. Read HyperBike: Hype or Hope? ; see a brief HyperBike video and interview.